As I sat on the train this morning, open book in hand, vaguely looking out of the window at the commuters on the platform of the station we’d just pulled into, I was suddenly struck by the sound of birds singing brightly and proudly. As the doors slammed shut and the train pulled away, onwards to the grey concrete city of London, the sound of those birds stayed with me, making me feel light and happy, and I walked to the office with a spring in my step. But by midday I was starting to flag and my step was losing its bounce. The day in the office was dull and uneventful and I soon found myself willing the hours away. I left feeling flat and a little melancholy. What I needed tonight was a meal full of the joys of spring that would require no more effort than some whizzing of the food processor, some heating of pans and some laying of salad leaves. 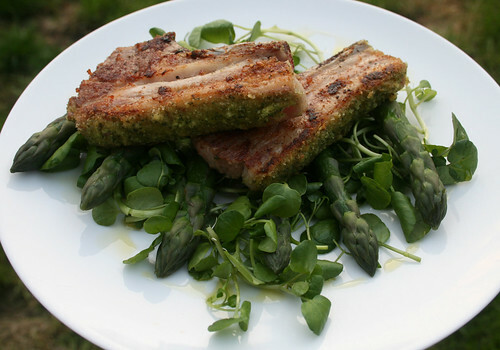 Tender lamb cutlets, juicy British asparagus, fresh herbs, and peppery watercress were all the ingredients I needed. I turned them into a fresh and bright salad to lift my spirits. As I sit here writing to you with my back door wide open I feel carefree once again as I listen to a chorus of birds bringing the gardens of these suburban terraced houses alive this evening with their songs. A reminder that it really is the simple things in life that bring us the most happiness. The herby breadcrumb mixture on the little lamb cutlets was really lovely so I think next time I’ll coat the whole of the cutlets in it. I imagine that brushing the entire cutlet with mustard would be too overpowering so I’d use a beaten egg to dip them in instead, before coating them with the breadcrumbs. Perhaps if you decide to try it this way and beat me to it you could let me know what you think? Place the breadcrumbs and herbs into a food processor and blend them together. If you haven’t got any breadcrumbs simply whizz up a slice of (preferably stale) bread with the herbs in the processor. Cut any excess fat from the tops of the lamb cutlets and then brush the tops of them with Dijon mustard. Press a generous amount of herby breadcrumbs onto the mustard to coat the tops of the cutlets with them. Heat a little olive oil in a frying pan over a medium high heat. Add the lamb cutlets and fry them for 2-3 minutes each side. While the lamb is cooking bring a pan large enough to hold the asparagus to the boil. Snap the woody ends ends off the asparagus then add the spears to the boiling water. Simmer them for 3 minutes then remove them and set them aside. When the lamb cutlets have finished cooking remove them from the pan and put them onto kitchen oil to drain and rest while you prepare the salad. Put the watercress onto plates and then place 6 spears of asparagus on top of each plate of watercress. Drizzle over a little extra virgin olive oil and then place 2 lamb cutlets onto each salad. Next Post See You There? Yum – lamb, asparagus, watercress – three of my favourite Spring flavours. I haven't had much lamb yet this year – might have to change that soon. Those lamb cutlets look very delish! I can see how this would put back that spring in your step. what a positively beautiful plate..so inviting! The lamb looks perfectly done, I can only imagine how good it must have been! Lovely meal-looks so colorful and inviting. what a gorgeous dish you've put together there – yum! I used to hate lamb as a child but I'm really starting to love it now. Think I'll be trying this one out! Sounds and looks fantastic. I love lamb, I have got a couple of lamb shanks in the slow cooker at the moment. I shall certainly be trying your recipe soon. I’m trying this tonight for me and my mum. Can’t wait! Absolutely amazing, I put the herb crust on all sides and it was amazing. The lamb was tender but crisp and the crust gave a lovely aroma and a great crunch. I served it with roasted asparagus and plum tomatoes with a splash of balsamic vinegar. Definitely going to have it again. Dennis – and I’m so glad you’re here!